The Launch Pad: Reminder: Ansari X PRIZE Anniversary Tweet Up Tonight! 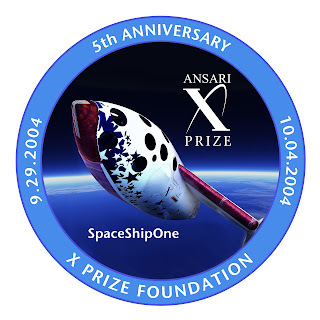 Reminder: Ansari X PRIZE Anniversary Tweet Up Tonight! Live in or near Los Angeles, CA? Looking for a fun activity tonight that has a lot of "Burt Rutan" and not so much "Brett Favre"? Come join members of the X PRIZE Foundation's space team, along with many other friends and space fans, for a night of new connections, nostalgia, and adult beverages. We'll be celebrating the 5th anniversary of the winning of the Ansari X PRIZE, the 52nd anniversary of the launch of Sputnik, and the beginning of World Space Week. We will also, I assure you, be raising a toast to wish good luck to the wonderful people working on Northrop Grumman Lunar Lander Challenge teams (including team Masten--who will by flying again on Wednesday!) and the LCROSS mission. Fifth Amendment is located at 129 Broadway, Santa Monica, CA 90401. There is parking in the nearby public garages (there is one on 4th and Broadway, and another on 2nd St). If you park after 6pm, there is a $3 flat rate. If you are feeling ambitious, you can try to find the "phantom X PRIZE office" only a few blocks away. The gathering will start around 7pm, and will end around 10pm local time [By special request, those times in UTC are 02:00 through 05:00 on Tuesday, October 6]. Please feel free to stop by for some or all of it! We hope to see you there! For those of you on Facebook, feel free to RSVP for the event there.